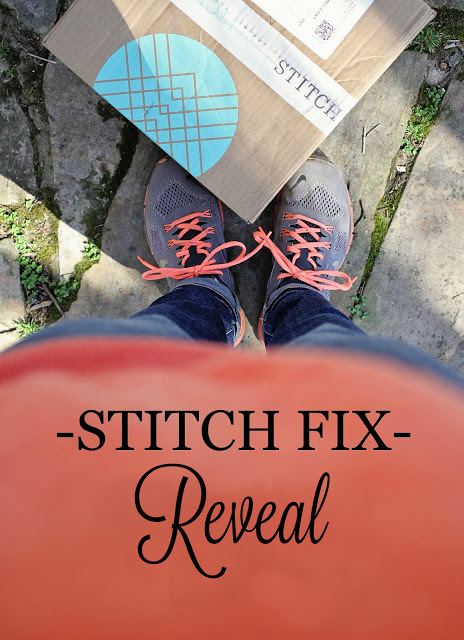 I'm so excited to share another Stitch Fix box with you. This box arrived just days after my birthday in January (don't ask...I'm really old) and I once again requested the same stylist I've had over the last year. Every box with her seems to get better and better, so I was excited to see what she'd pull together for my birthday. I request a few of my "favorite things" in this box - anything bright and colorful (bonus points for something yellow), anything with polka dots, ruffles or peplum, a vest or jacket and an amazing pair of jeans. JessicaV got the job done and hit all my requests. I was so excited to pull out each piece and know she really paid attention to what I asked for. I was extra picky this month, so I only ended up keeping 1 out of the 5 items, but I honestly could have kept them all and been happy with them. After I adjusted my sizes last month, everything fit so much better and I'm already looking forward to my next fix. And speaking of "next fix" -- if you want to win an AWESOME giveaway for a $150 gift certificate to Stitch Fix for your next fix, make sure you read all the way to the bottom of this post! This was probably my least favorite item in the box, but looking back at the photos, I kind of wish I would have kept it. When I tried it on the first time, I didn't love the color. It looked very garnet, and while that's my birthstone, I just don't love that dark color on me. I love bright red, but burgundy/wine...not so much. However, once I got outside the color was so much lighter/brighter - more of a raspberry color and I loved it so much more. I also really loved the v-neck on the shirt and the length. However, I just couldn't get on board with the lattice/cut-out look and felt like the body of the shirt just hung boxy on me. Maybe I just needed to steam it or something. Like I said, looking at these photos, I'm not sure I see that and now I'm kicking myself a little bit for sending it back. Next up, yellow! While I prefer bright lemon yellow, this mustard color was so pretty! Perfect for fall and winter. The length was great and I loved the softness of the knit, but the lace on the top just turned me off. I love wearing camisoles under shirts (and non-strapless bras) - both of which would be impossible with this top. And I felt like the lace was a little too old lady and dated me a bit. I felt the same way trying on lace wedding gowns - lace just doesn't work on me. Gah! How cute is this little black and white polka dot puffer vest?? I wanted to love this vest so much, but it just didn't do anything for me. So much potential and then it just looked plain and boring when I put it on. I don't know! It's sporty and casual and so me! I tried it on with a number of different tops in various prints/patterns/colors/styles and it just didn't look as cute on me as it looked on the hanger. I also have a number of black/grey puffy vests very similar to this one, so maybe it was just looked too much like what I already have to stand out. Maybe next time I'll ask for faux leather or shearling or something a bit more exotic? Another one that was SO close, but just barely missed the mark. These distressed jeans were so comfortable, with just the right amount of distressing in a great color. They fit perfectly around the middle, however, they were just a teeny tad bit too short (that never happens!!) - they hit right above my ankle - and I thought they'd look ridiculous with heels. I almost kept them anyway to wear with with flats and boots (as pictured), but then the ankle zip part of the jean was really uncomfortable when tucked in. The zipper hit right on the bony part of my ankle, making them impossible to wear with boots. Womp womp. I was not expecting to love this jacket as much as I did when I first pulled it out of the box. Heather grey usually washes me out, but this jacket was just too good to pass up. The black leather details on the jacket made it just a tad bit edgy/modern, while still being really warm and comfortable. I loved the cross-body asymmetrical zipper and the collar and thought it looked just as cute zipped up completely as it did half-zipped. This is one of those items that's casual enough to wear with jeans and boots on the weekend and can also be dressed up with a pair of black slacks and black heeled booties to work. What do you think of this fix? Did I keep the right pieces? So many great options! total bummer about the jeans because they are so cute! And I really like the mustard yellow top but I can't so strapless bras, either. So, yea. So excited about the giveaway!! Love the jacket! I don't think I'd like the cut outs and lace details on the tops either. Sara, you look gorgeous in all shades of yellow! Kinda sad you let that top go. But you know comfort is key in my book! That moto jacket is awesome! You looked amazing in it all! I'm seriously crushing on the Norden Lattice Detail Blouse and Lace Yoke Knit Top! But, the moto jacket? Holy buckets, perfection. Pinning the crap out of that one right this second. You always make everything look fabulous! Love the jacket you kept - it's perfect on you! Agree about that vest, it's just a little too boring. However, I love the red top! I love love love the jacket you kept! So cute. And I think that red top should have been a keeper. it looks so great on you! Love the jacket. The outfit looks super cute and you wear it well. I actually really liked the vest too. I loved that yellow top from afar, but then when you did the close up on the lace, I could totally see what you meant by old lady. That's a total bummer because in the pictures from afar, it looks cute! LOVE that jacket you kept though! I love the jacket you kept, but that red top is my fave on you! So pretty!! But I like flowy tops, so if you don't I totally get it. You always look cute in your stuff!! I just binged through your Stitch Fix. LOVE so many of your picks! Who is your normal monthly stylist?! LOVE that jacket! The red shirt too, but if I had to pick just one thing I would've kept the jacket too. That red looks SO good on you. Next time? Keep the shirt. It's STUNNING on you... and you're looking AMAZING, mama!